This is a story of a bizarre submission experience with The Portland Review. 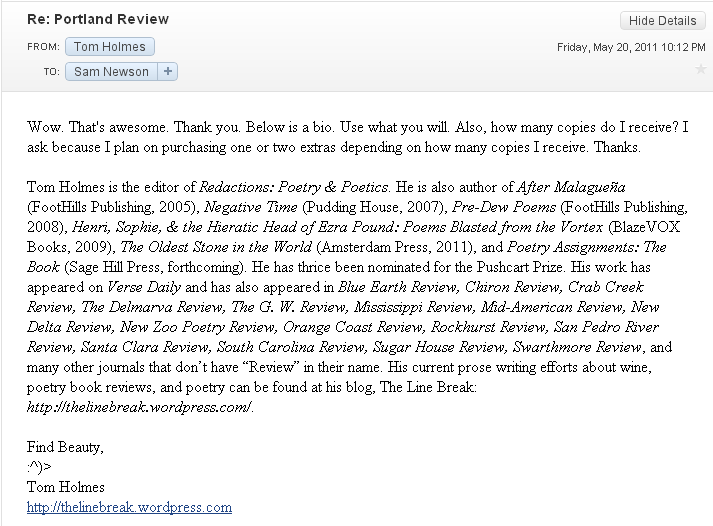 On February 9, 2011, I submitted five poems to The Portland Review, which is a fine journal that I admire. They put out poems that I enjoy. I simultaneously submitted these poems to other journals, too. On April 23, one of those poems was accepted elsewhere, so I withdrew it from consideration at The Portland Review, and there were no problems. 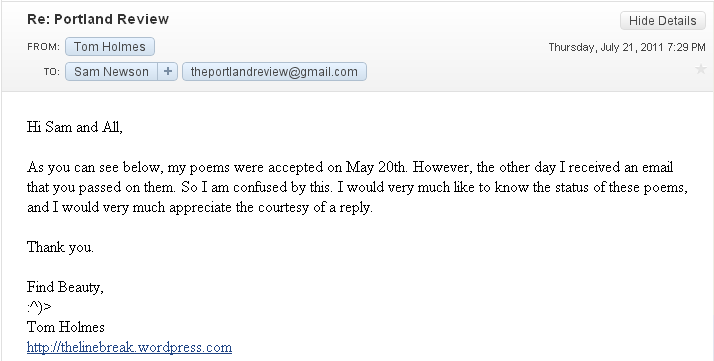 On May 19, I received the following acceptance email from The Portland Review. Woo hoo! I’ve always wanted to be in this journal, and finally I will be. However, which poem did they accept? It doesn’t say. Might they have accepted more. I hope so. But I needed to find out, so I wrote them back asking which poem or poems were accepted. They replied promptly, within four minutes, with this email. Oh, man they took all of the four remaining poems. I was so happy because I had just begun this long series of poems about the Paleolithic artists who painted all those paintings in the caves in France and Spain and elsewhere. Actually, the poems are broadening out to the whole Paleolithic area and era. 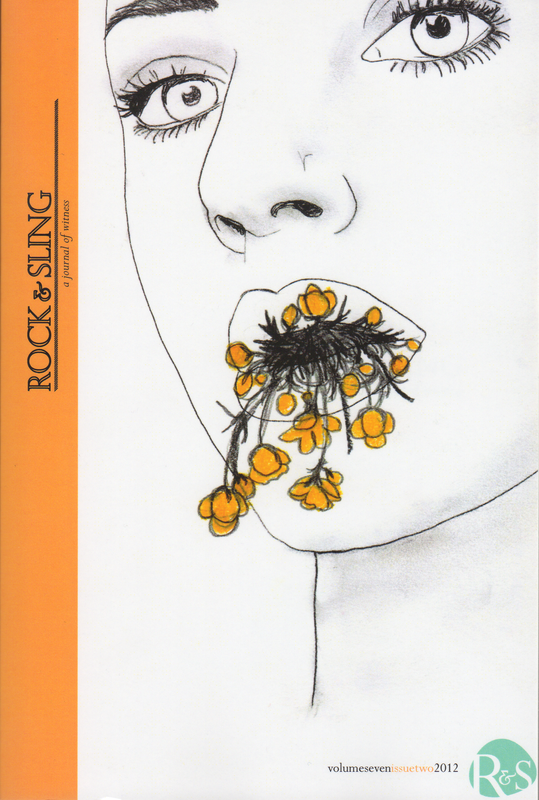 So I even have poems about the invention of the needle and the doll and other things. All’s good in the world! . . . until July 18. What? Hunh? Hey, you guys already accepted these poems. What’s this email about? Oh man. What’s going on? So I responded as soon as I read the email, which was about an hour after Sam Newson, the poetry editor, sent the rejection. Man, I had to write a lot of withdraw letters and emails. That took up some time and postage. Now, if these poems are truly rejected, I can’t send these poems to those magazines from which I withdrew them. The editors at those journals will be majorly confused and it will make me look silly. Now, my poems have less places to find a home, share their beauty, and change people’s lives. Two days later there is no response. Last time they responded within the same day, within four minutes. Man, what’s going on? I’m kinda getting pissed here. So I wrote them again. I’m being professional here. Am I not? They certainly aren’t by rejecting what they accepted and not responding. Of course this non-response continues. I wrote them again the next day. This time to both the editor and Sam Newson. Ok. So that’s enough emails for now. Surely, someone has to respond. Now, it’s Tuesday, July 26. It’s been a full week and a full day, and no one has responded. This is very unprofessional of Sam Newson and The Portland Review. It’s unethical, too, to accept poems and then reject them. Further, what I am supposed to do with these poems. Are you going to use them in an upcoming issue or not? I need to know so I’ll know what to do with the poems. I mean, if you are not going to use them, let me know so I can send them back out into the world so they can find a home. 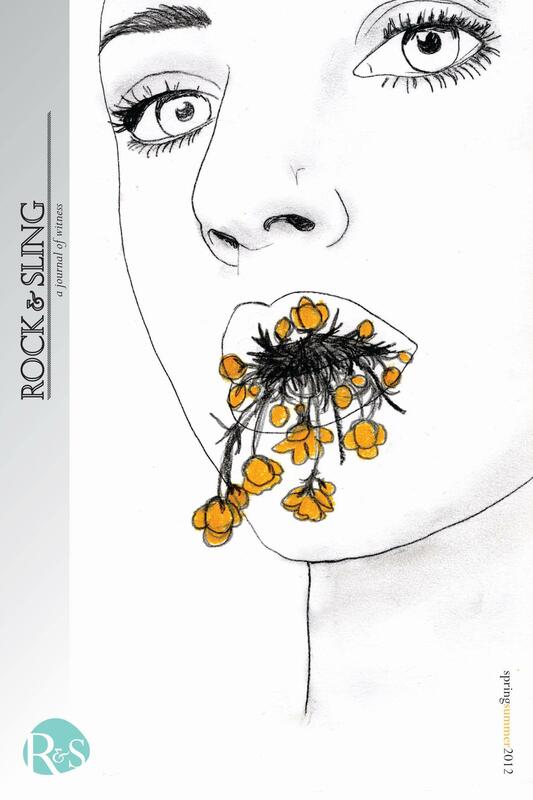 As an editor, I know what to do – You accept the poems you once accepted, and you respond. In the end, I just hope this is just a mistake like the time a journal accepted my poems, printed them in their journal, sent me two contributor copies, and, then, a few months later rejected those same poems. Now that was funny. I hope this ends in an equally funny manner. Until then . . .